In this article we take a look at how location information can be used to sort a list of items on a webpage. This might be useful for local search results; for example ‘Restaurants near me’ type searches, or for sorting a predefined list of locations such as a company’s office locations in order of distance from the user. Contextualising information based on location offers excellent usability benefits, particularly for mobile users where input is often more difficult. Who hasn’t felt the pain of scrolling through a long list of countries in a drop-down list for example? Such usability issues can make or break the mobile user-experience—users may not even realise that things have been reorganised for them based on their location, but they may well get frustrated when they aren’t! In the example that follows, we’ll assume we have a list of points of interest (POIs) and that each POI has location information in the form of a latitude, longitude (latlon) pair. For this article we’re not concerned with where this list of POIs comes from, whether it’s the result of a local search, or a predefined list of locations. We’ll also consider how we might handle low-end devices as well as high-end. For high-end devices, we’ll use the HTML5 Geolocation API to determine the user’s location, and to perform the sorting based on this data. For low-end devices that don’t support geolocation it would be easy to simply output an ‘unsupported’ or ‘upgrade your device message’ for functionality like this. However, we’ll go one better and consider how, with a little bit of server side help, we can provide a similar experience for such devices. View a live example right now, or continue reading to see how it works. and low-end (right) after location has been acquired—note the manual entry. Click to view the demo. (Note: error checking code has been ommitted here for brevity—see this article for more details about how to handle errors). To use this script, we need to define our POI latlons as LatLon objects as defined in Veness’ script. Then we’ll be able to apply the distanceTo and bearingTo functions to any pair of LatLon objects e.g. So, why bother to render the list at the beginning if we are going to sort again it anyway? The reason for this is that we don’t want to block while waiting for the location permission to be granted by the user, or while we wait for the user’s device to get a location fix. If we do it this way, we can display something to the user right away, and if and when the user’s location is determined, then the presentation of the information can be improved. One option is the use of GeoIP techniques. 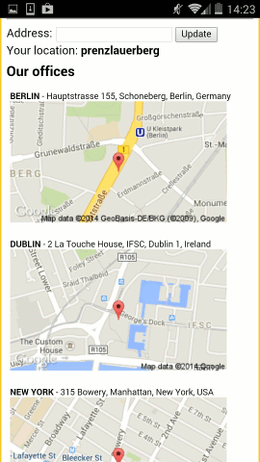 GeoIP uses the device IP address to determine the approximate location of the user. It is reliable to country, and often city resolution, and so could be used for applications which don’t require finer granularity than country or city level, such as rearranging a list of countries in a drop-down list, to take an example we mentioned earlier. However, if the application needs to make use of local information, such as restaurants near me type searches, then the usefulness of GeoIP techniques will be limited. A simple but effective solution for low-end devices is to allow the user to manually enter their location. Yes, it’s a low-tech solution to the problem, but even a partial address can be geocoded accurately enough to be usable for local search. To implement this, a form will be presented as a simple unobtrusive textbox, and if the user chooses to ignore it, then the webpage will still work with the default list ordering. When a user enters an address or location however, we’ll determine the latlon for the entered location using Google’s free Geocoding API, and then we’ll sort the list of locations as we did for high-end devices, but this time on the server. So, similar functionality will be available for the low-end user, but the user will have to work just a little bit harder for it. We use a similar algorithm as before to compute the distance between two latlon points, but this time on the server. Various different distance algorithms are possible, the following code uses the Haversine distance. 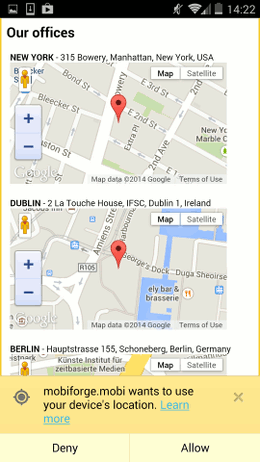 For completeness, and to make the example a little more appealing, we’ll add a Google map for each of our POIs. View the live demo now! In this article we showed how location information can be used to change the sort order of data presented to a user. For high-end devices, we used the HTML5 Geolocation API to determine the user’s location. We also considered low-end devices that might not have location capabilities, and in this case, we allow the user to manually enter a location. In both cases, a default sort-order of the data was presented when no location information was available. In the high-end case, this is so that we are not blocking page rendering while waiting for location permission to be granted, or while waiting for a GPS fix for example. In the low-end case, the list order is updated if and when location information is provided by the user. But in either case, there is always some information that can be displayed right away, and this is refined later if possible.